Travelling around the Edmonton region in a vehicle for hire starts with a trip request. There are two ways to request a trip: by hailing a vehicle from the street or requesting a vehicle in advance. In the City of Edmonton, only taxis and accessible taxis can be hailed or flagged from the street. Trips for these services may also be requested in advance, using a variety of different methods including a web reservation, a phone reservation, or mobile app. Requesting trips using limousines, private transportation providers, shuttles, or transportation network vehicles must be made in advance via phone, website, mobile app, or other methods, before the vehicle arrives to pick you up. These vehicles can not accept a flag or hail from the street. 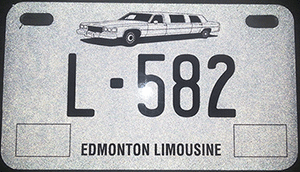 Licensed limousines will have the current City of Edmonton issued limousine plate attached to the front of the vehicle. This plate begins with “L” followed by a three digit number. Before you enter a Private Transportation Provider vehicle that you’ve requested a trip for, follow these steps to make sure it’s the vehicle and driver that you’ve requested. 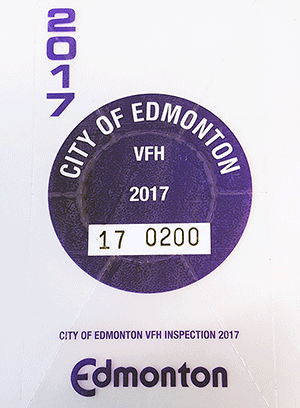 Check and make sure this sticker is visible before you enter the vehicle. Check the provincial licence plate to confirm it is the same as the one provided by the company through the website, mobile app, or other method. Check that the driver information is the same as what was provided to you by the company through the website, mobile app, or other method. 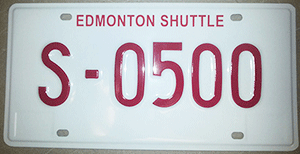 Licensed shuttles will have the current City of Edmonton issued shuttle plate attached to the front of the vehicle. This plate begins with “S” and is followed by a four digit number. 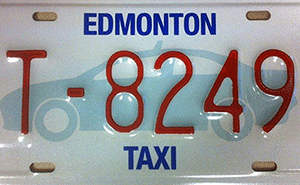 Licensed taxis will have the current City of Edmonton issued taxi plate attached to the front of the vehicle. This plate begins with “T” and is followed by a four digit number for a standard taxi and an “A” followed by a three digit number for an accessible taxi. Before you enter a transportation network vehicle that you’ve requested a trip for, follow these steps to make sure it’s the vehicle and driver that you’ve requested. The company logo must be displayed on the front and rear of the vehicle. Check that the vehicle is from the company that you requested. $3.25 for any pre-arranged service cancelled upon arrival without prior notice. Fare for trips that have been prearranged are set at a minimum of $3.25. 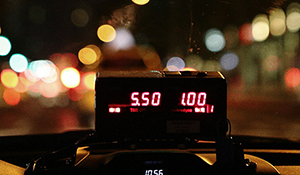 Taxi fares to the airport can be either the fare calculated by the vehicle taxi meter or the flat rate established in the Edmonton International Airport fare map, whichever is less. Please contact 311 with your contact information and details, such as date, location, company, driver description, and nature of problem, about the complaint. The 311 team will forward your complaint to our enforcement team to investigate. By filing your complaint through the 311 service, our enforcement team can better track complaints on all vehicle for hire companies and address your concerns.